Place the crabmeat in a medium bowl with lemon juice, onion or shallot, pepper and salt. Cover the bowl with plastic and refrigerate in a few minutes. Fill the tortilla with the crabmeat mixture and guacamole. Decorate the nachos with cilantro and jalapeño to give them more color and flavor. Enjoy! Skip the jalapeño if you don't like spicy food. I love having guests over, but I must confess that that unexpected visitors give me a little bit of anxiety. Especially when it's my husbands hungry friends come over to watch sports and I haven't prepared anything to offer them. 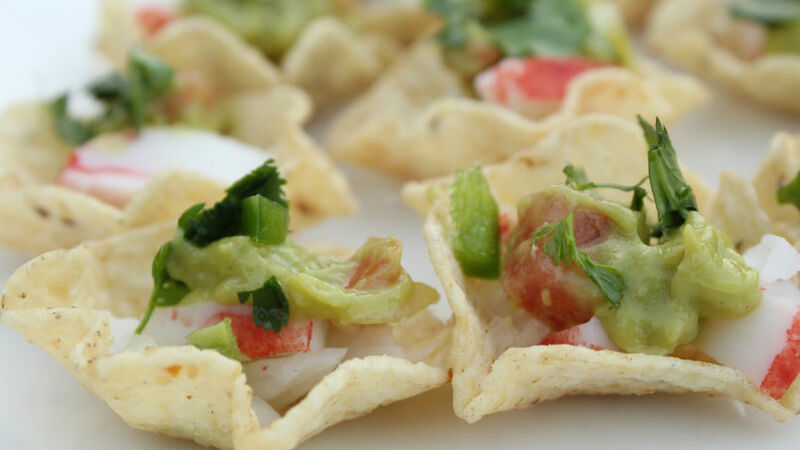 Mexican food is the star attraction at many of my parties and these delicious crab nachos have saved me when I'm short on time. They're incredibly easy and so beautifully prepared that I'm proud when I receive compliments on them. It takes just about 15 minutes. I hope you like them!